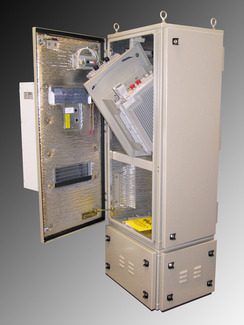 Our UL® listed Modular Equipment Cabinets are an industry proven product designed specifically to accommodate challenging requirements in permanent wireless applications. Each configuration is NEMA rated and designed to withstand wind driven rain, vibration, drop, thermal and seismic zone-4 standards. As a custom equipment cabinet manufacturer, we can tailor the cabinet around the customer's required dimensions, alieviating expensive and time consuming site modifications. 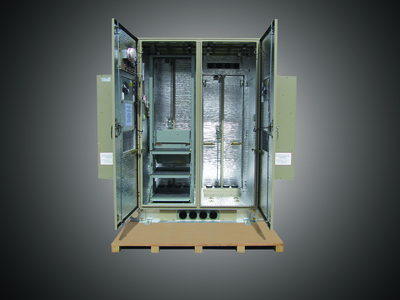 Our In-Line, or "Walk Up" equipment cabinets are an industry proven product designed specifically to accommodate challenging requirements in permanent wireless applications. 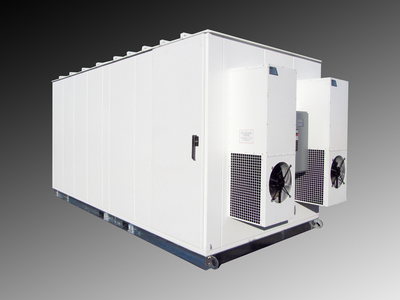 Each configuration is designed to withstand wind driven rain, vibration, drop, thermal and seismic Zone-4 standards. Each cabinet is quality constructed per NEMA 4/3R (National Electrical Manufacturers Association) outdoor use standards. Our Flex-Line, or "Walk-In" equipment cabinets are an industry proven standard product with over 15 years of service reliability. 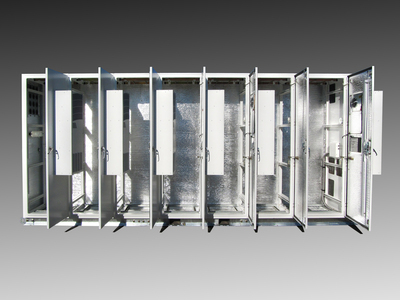 We manufacture a very flexible modular design cabinet system which generally starts with a basic 4-Bay module. It can then be expanded a bay at a time, or all at once, up to 10-Bays. We have been very successful in providing our customers with solutions for housing their equipment in a flexible, well designed, environmentally controlled, UL® listed cabinet. The Sun West cabinet system is UL® listed as a Wireless Communications Cabinet and has been P.E. Certified to a 150 MPH wind load for South Florida and Zone-4 Seismic for the West Coast. Our Custom Solution Cabinets continue to be an industry proven product designed specifically to accommodate challenging requirements in permanent wireless applications. These lightweight cabinets come in many different styles and can be configured to conform to difficult site locations such as; rooftop mounts, parking garages, trailer mounted COWS or truck mounted COLTS.